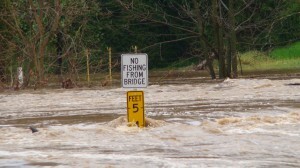 A flood is defined as any high flow, overflow, or inundation of water that causes or threatens damage. Flooding can occur with prolonged rainfall over several days, intense rainfall over a short period of time, or when water from an existing source moves too quickly (i.e. snowmelt, dam break, etc.). 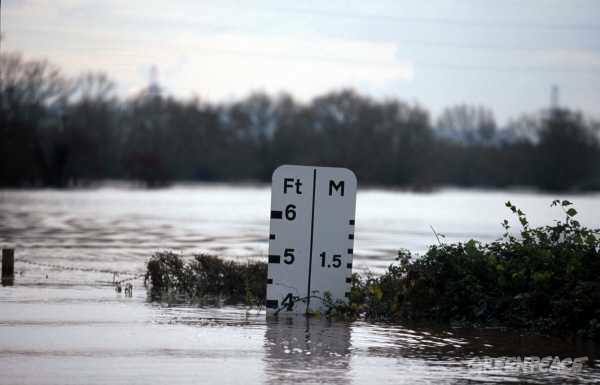 Do you know what the flood hazards are in your area? FEMA is revising their maps. Go here to find out if the map of your area has been revised. More information about these flood hazards can be found on the NWS Flood Safety Website at http://www.floodsafety.noaa.gov. A rapid and extreme flow of high water into a normally dry area, or a rapid water level rise in a stream or creek above a predetermined flood level, beginning within six hours of the causative event (i.e. intense rainfall, dam failure, ice jam). 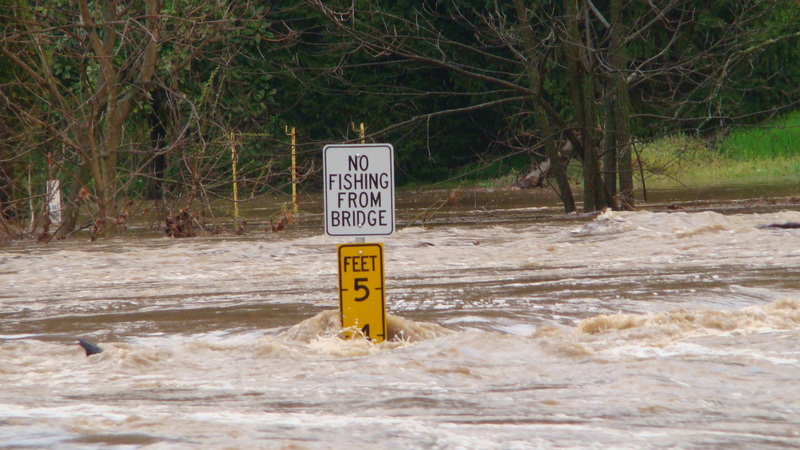 River flooding occurs when rivers rise and overflow their banks, inundating areas that are normally dry. At any time of year, a storm from over the ocean can bring heavy precipitation to the U.S. coasts. 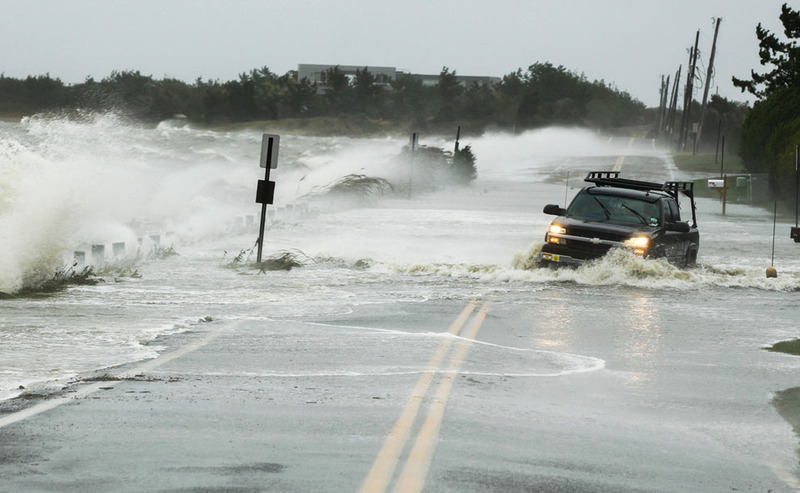 Whether such a storm is tropical or not, prolonged periods of heavy precipitation can cause freshwater flooding in coastal areas, as well as further inland as the storm moves onshore. In addition to the freshwater flood threat, tropical systems and nor’easters can bring the threat of storm surge related coastal flooding. Wildfires burn away the vegetation of an area, leaving behind bare ground that tends to repel water. 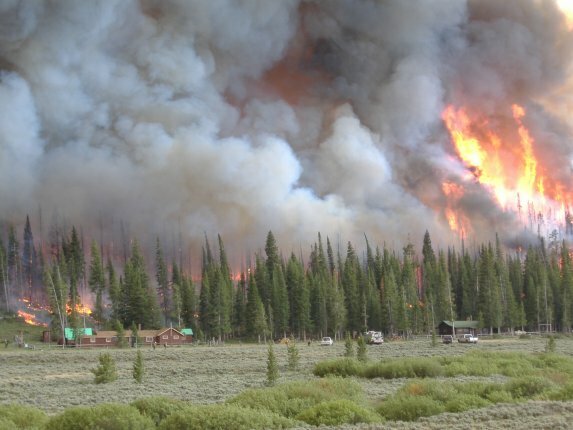 When rain falls, it runs off a burn scar towards a low lying area, sometimes carrying branches, soil and other debris along with it. Without vegetation to hold the soil in place, flooding can produce mud and debris flows. Flooding due to snowmelt most often occurs in the spring when warming temperatures quickly melt the snow. The water runs off the still partially frozen or already saturated ground into nearby streams and rivers, causing them to rapidly rise and sometimes overflow their banks. A backup of water into surrounding areas can occur when a river or stream is blocked by a build-up of ice or other debris. When heavy rain falls over dry land, the water rushes towards low-lying areas, which may include dried up canyon or stream beds. This can quickly turn a dry channel into a raging river. A break or failure can occur with little to no warning. Most often they are caused by water overtopping the structure, excessive seepage through the surrounding ground, or a structural failure.